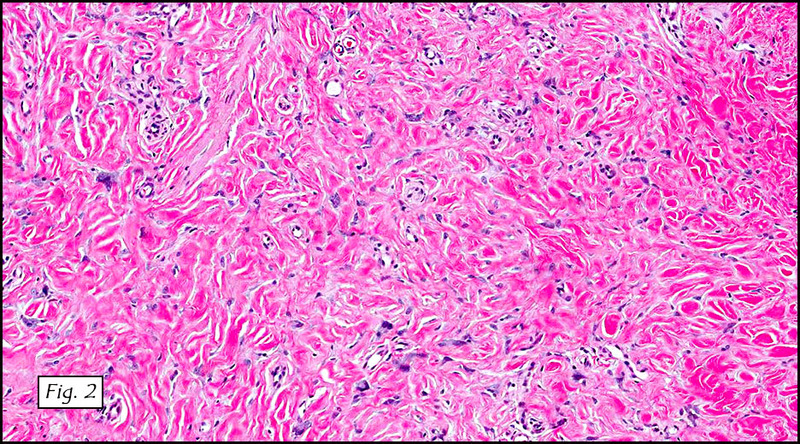 History: A 37-year-old man presented with a well circumscribed, unencapsulated, bluish pink 2.3 x 2.3 cm nodule on his right shin. A 2.0 x 2.0 cm shave biopsy was taken (Fig. 1). 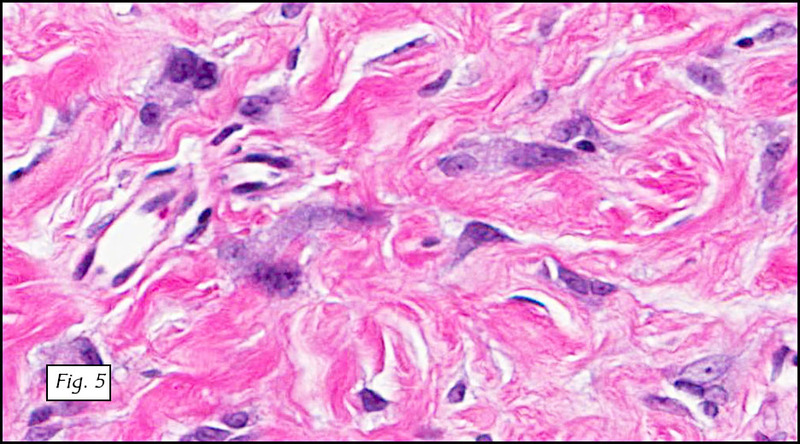 Microscopically, the tumor was dermal-based and involved adnexal structures. It consisted of disorganized collagenous fibers (Fig. 2) admixed with scattered hyperchromatic pleomorphic cells. Myxoid stromal change and storiform patterns were also seen (Fig. 3). The pleomorphic cells showed enlarged, spindled to stellate-shaped nuclei with small basophilic nucleoli (Fig. 4). 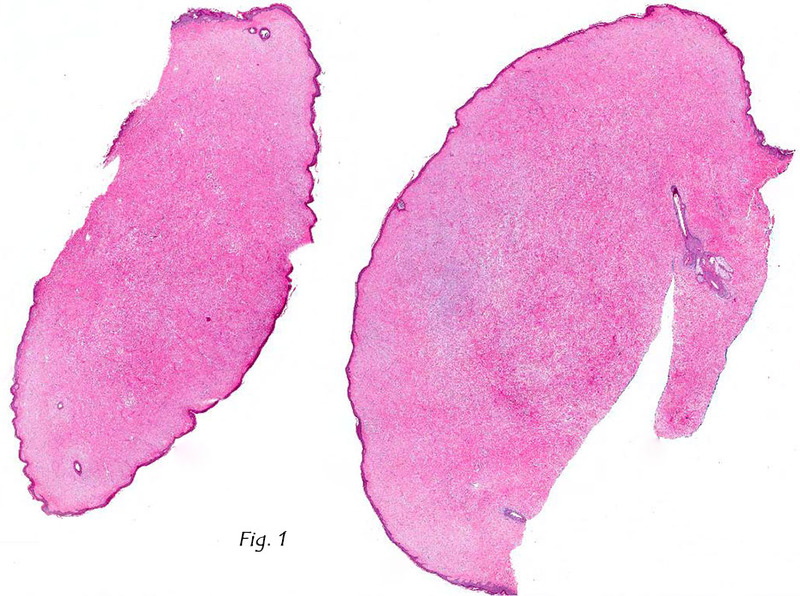 These atypical cells showed marked variation in nuclear size and shape. Generally they had indistinct cytoplasmic borders. Many of the more bizarre cells showed enlarged hyperchromatic nuclei (Fig. 5). Multinucleated giant cells with jumbled nuclei were occasionally present. Mast cells, adipocytes, hemosiderin or other pigments were absent. Neither necrosis nor mitotic figures were identified. 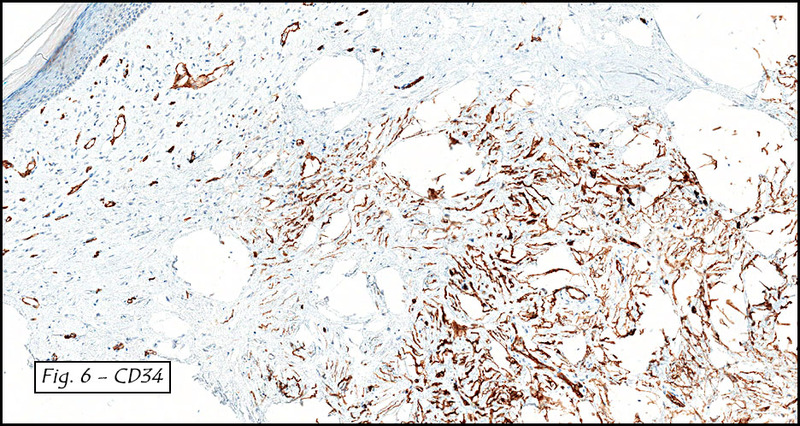 A CD34 stain highlighted the atypical cells, stroma and blood vessels (Fig. 6). Li Lei, M.D., Ph.D., Camilla Cobb, M.D. and Donald R. Chase, M.D. 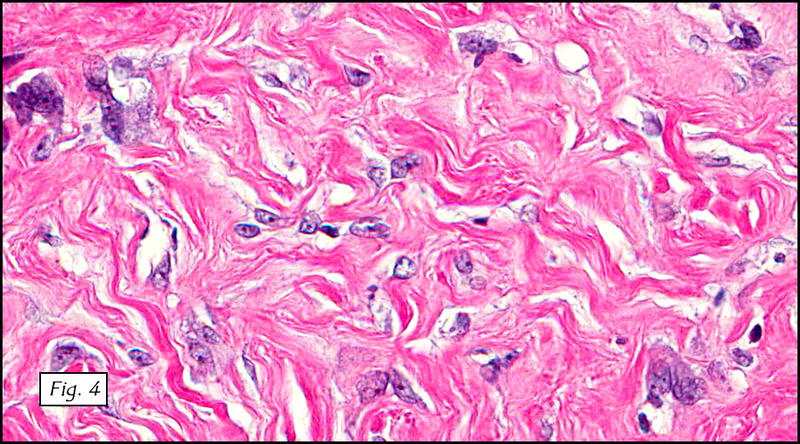 Discussion: Pleomorphic fibroma (PF) of the skin, as its name implies, is a cutaneous lesion characterized by pleomorphic cells in a fibrotic stroma. A lesion of similar morphology may be seen in tendons and has been termed “PF of tendon sheath”. PF was first described in 1989 by Dr. Kamino et al. Since then only a handful of cases have been reported. The incidence and prevalence of PF are unclear. Goldblum J, Folpe A, Weiss S. Enzinger & Weiss’ Soft Tissue Tumors, 6th ed: Philadelphia, Elsevier Inc, 2014; 216-218. Brenn T. Pleomorphic dermal neoplasms: a review. Adv Anat Pathol. 2014;21:108-30. Al-Zaid T, Wang WL, Lopez-Terrada D, Lev D, Hornick JL, Hafeez Diwan A, Fletcher CD, Lazar AJ. Pleomorphic fibroma and dermal atypical lipomatous tumor: are they related? J Cutan Pathol. 2013;40:379-84. 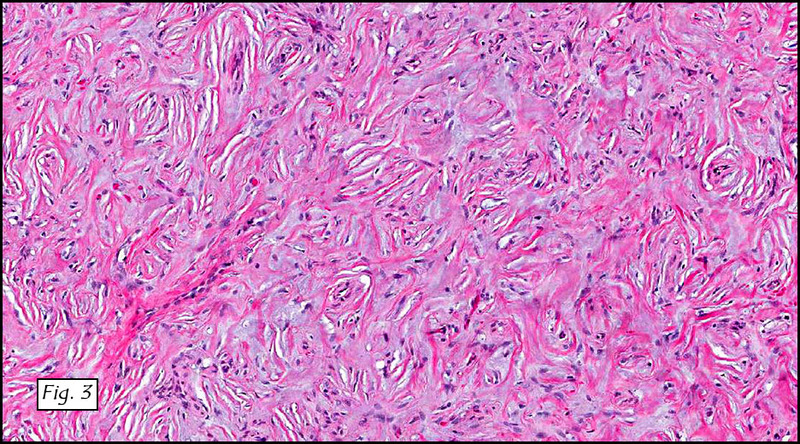 Aguilar C, Rosai J. Pleomorphic fibroma of the skin, atypical lipomatous tumor, or both? Int J Surg Pathol. 2011;19:63. Dore A, Robertson I, Williamson R, Weedon D. Progression of a myxoid pleomorphic fibroma to myxofibrosarcoma. Australas J Dermatol. 2003;44:287-90. Rudolph P, Schubert C, Zelger BG, Zelger B, Parwaresch R. Differential expression of CD34 and Ki-M1p in pleomorphic fibroma and dermatofibroma with monster cells. Am J Dermatopathol. 1999;21:414-9.